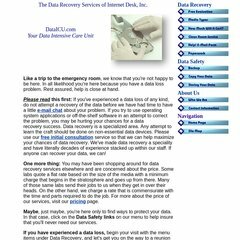 Topics: Free Initial Consultation, Data Recovery, Pricing, [free Evaluation], and [media Types]. The site has about 7 users daily, viewing on average 3.00 pages each. Its 2 nameservers are ns1.dataicuhost.net, and ns2.dataicuhost.net. It is hosted by Layered Technologies Inc (Texas, Plano,) using Apache/2 web server. Dataicu.net's IP address is 72.233.54.197. PING (72.233.54.197) 56(84) bytes of data. A ping speed test response, is timed at 23.8 ms.